Potato soup is one of my favorite kinds of soup, specifically this Roasted Potato, Onion, and Garlic Soup. I thought about making it last weekend, but also had a bunch of carrots sitting around so I looked for something new. I came across this recipe for Creamy Carrot and Potato Soup with Dill and thought it sounded really interesting. Dill isn't something I'd think to put with carrots and potatoes in a soup, so I had to give it a try, and luckily I had some dried dill to use. I used the author's recommendation to add Dijon mustard and omit the Worcestershire. 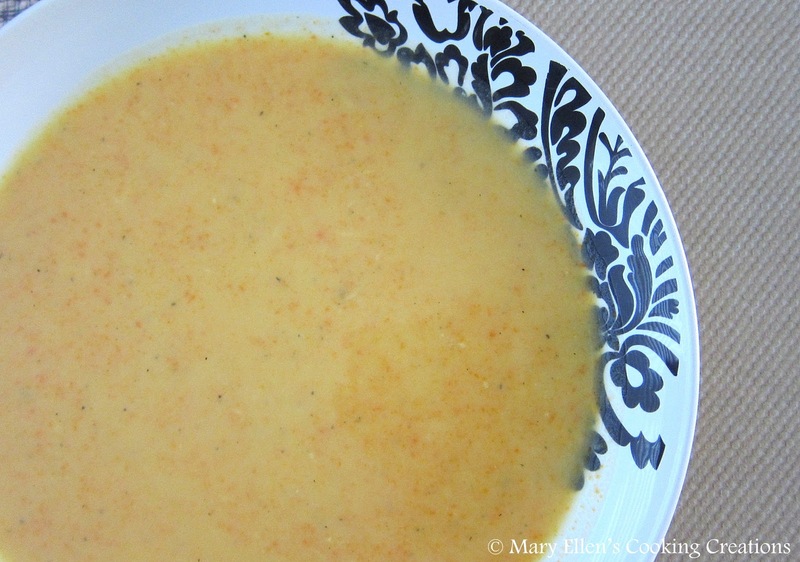 Unlike the author, I did not grate my potatoes and carrots but instead turned this into a smooth pureed soup. I loved that at first the soup tasted sweet and creamy, but then you were hit with another level of flavors from the dill and Dijon. I'm trying to think of some words to describe it and "sophisticated" keeps coming to mind. Give it a try and let me know what you think! Add the carrots and potatoes, stir to combine with the onions. Add the thyme and dill, followed by the broth. Bring to a simmer; continue simmering for 15-20 minutes or until veggies are tender. Remove from the heat and using a handheld immersion blender, puree the soup (or transfer to a blender and puree in batches). Return to low heat and stir in the dijon and cream. Once warmed through, add the cheese and season to taste with salt and pepper.